When redditor pat_inthehat posted that his aunt makes wedding cakes, he made a serious understatement. She doesn't just make cakes; she makes delectable vessels of flour and frosting. 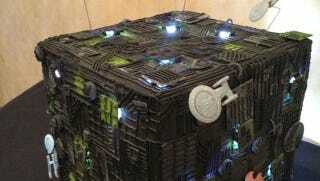 Her Borg Cube cake is fantastic, swarmed by little plastic starships, but that won't save it from being assimilated into the guests' bodies. Said aunt makes cakes at the Sugarplum Cake Shoppe in Colorado Springs. The bakery also makes classic tiered wedding cakes, but what's the fun in that?